Lion Dance Festival slot is yes, yet another Oriental-themed game, as the word 'festival' in the title may have indicated. Haunting Chinese pipe music is the aural background while red lanterns form the visual background of this 243 way, 5 reeler. As you spin drums add to the music to make the game sound a bit more dramatic as the single symbol crash to a stop on the reels. The Child Emperor is the best 5-of-a-kind win to land, paying a handsome 40x stake along with the Golden Dish and box of lucky tokens. The lower card symbols pay 10, 6 and 4x stake for 5 as you count down from A to 9. Wilds are present on the middle 3 reels in the form of Chinese Lanterns with no multiplier attached and we will also discover Firecracker scatters on the first 3 reels and Dragon scatters on the last 3, which indicates that again Genesis Gaming have developed a dual-featured slot! Firecracker scatters on reels 1, 2 and 3 trigger the Dancing Lion free spins. You can select 5 with a 10x multiplier, 10 with a 5x and 15 with a 3x - your choice! Retriggers are possible and now the top paying tiles could pay 400x stake for a 5 reel combination. Explosive stuff. 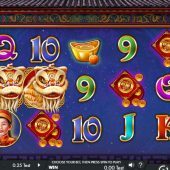 Dragon scatters landing on reels 3, 4 and 5 initiate a Fireworks pick-me feature which as you no doubt have guessed means lighting various fireworks and winning cash amounts until a 'collect' is revealed. This can be triggered in the Dancing Lion free games too.